The Glacier Battery Operated Platform Lift accommodates an Aquatic Wheelchair for the individual that needs assisted stabilised support for entry into the pool or spa. The Glacier Battery Operated Platform lift is designed for use in commercial swimming pools. The lift has been specifically designed to replace the need for a ramp in a pool having no less than 914 mm deck to the floor of pool at the installation site. This lift is self-operated & electrically (low voltage) powered. The lift is rated for a 272 kg lifting capacity with a safety factor of 1.5. Operating Controls & Power Source A four channel radio frequency receiver/transmitter controls the operation of the platform lift.. The Pal Hi-Lo Aquatic Lift is a portable free standing lift. Easy to move by one person. A lifting capacity of 136 kg with 240 degree rotation. Designed for facilities that have both inground pools and raised spas. The Pal Hi-Lo is a 24v battery powered and operated by a screw driven actuator. It features full mechanised left and right as well as up and down motion. The design and durability of the system ensures consistent operation and minimises service problems. The Pal Hi-Lo is virtually maintenance free. The components are made from corrosion resistant materials, including powder coated stainless steel and aluminium construction. The unique .. The Pal2 Aquatic Lift is a Fixed Portable free standing lift. Easy to move by one person. A lifting capacity of 136 kg. The Pal2 is a 24v battery powered and operated by a screw driven actuator. It features full mechanised left and right as well as up and down motion. The design and durability of the system ensures consistent operation and minimises service problems. The Pal2 is virtually maintenance free. The components are made from corrosion resistant materials, including powder coated stainless steel and aluminium construction. The unique seat of the lift was specifically designed to provide the user with the greatest possible safety, comfort and ease of transfe.. The Splash Aquatic Lift is a semi-portable lifting system designed for swimming facilities seeking to provide user friendly access to their swimming pools. 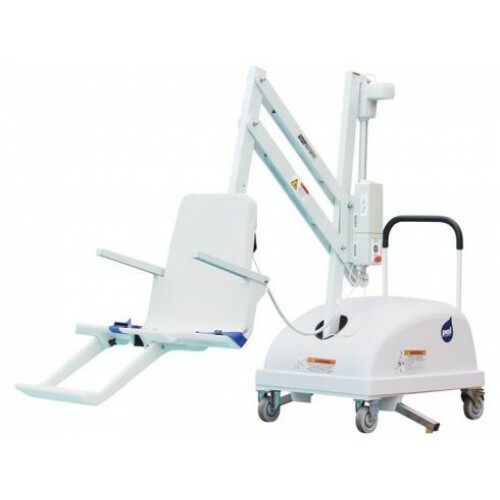 A lifting capacity of 181 kg for the Standard lift and 136 kg for the Extended Reach.The Splash is a 24v battery powered and operated by a screw driven actuator. It features full mechanised left and right as well as up and down motion. The design and durability of the system ensures consistent operation and minimises service problems. The Splash is virtually maintenance free. The components are made from corrosion resistant materials, including powder coated stainless steel and aluminium construction. The unique seat ..